Who knew submitting a photo for a contest would lead me to an awesome opportunity? ...and kept it moving. A couple days later, an Avenue representative hit me up via e-mail to tell me that I was selected as the winner! The prize: a $25 gift card. 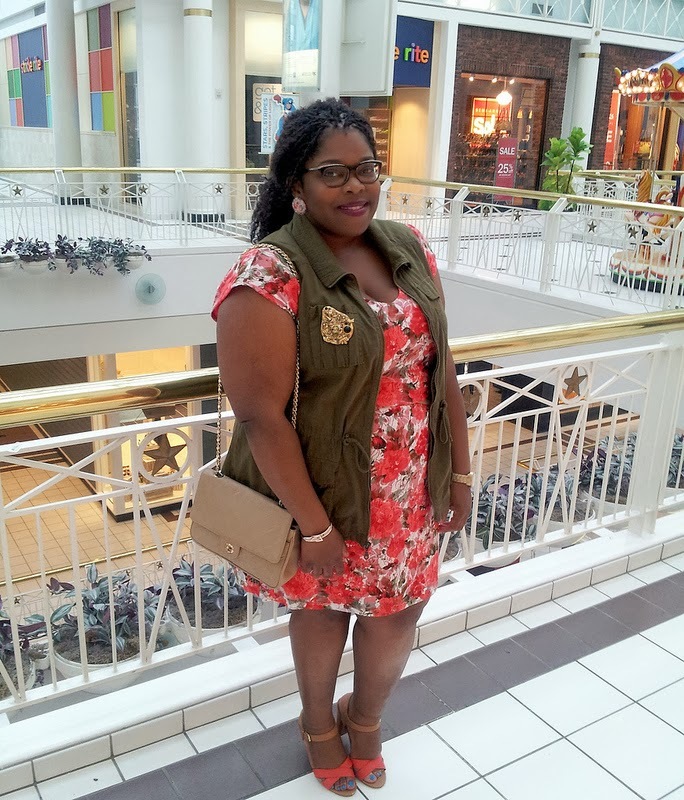 From there I got another e-mail stating how great my style was and what were my sizes so they can send me their latest items to review. Say what now? It was a darn good day. Now, I've been pretty vocal about my new found love for Avenue. There was a time when you would not have seen me anywhere near an Avenue store. It was like, me? In an Avenue store? Nah. I don't know when my perspective changed but I found myself shopping bit by bit at Avenue. From the lingerie to the fashion tights to the jewelry to the shoes, and finally, to their clothes. Really, don't look at Avenue as a frumpy store. It has some cute, stylish items if you take your time and look. Still need proof? Check out my posts featuring a Avenue item here. I was sent three items to review. First up: Marled Striped Cardigan. It was a nippy day this past Saturday but not so nippy that I needed a jacket/coat. 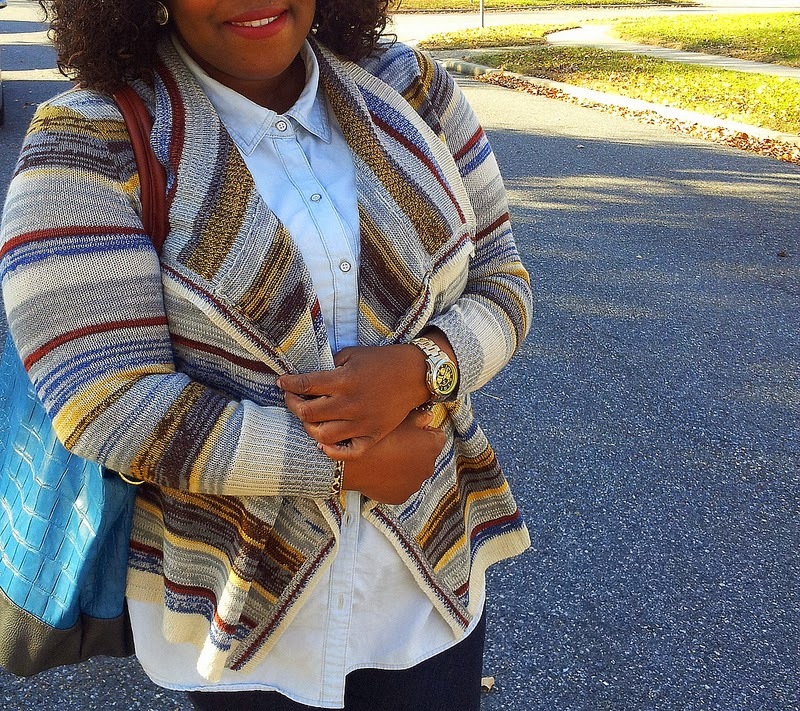 To keep me warm, I layered the cardigan over my sleeveless denim top. 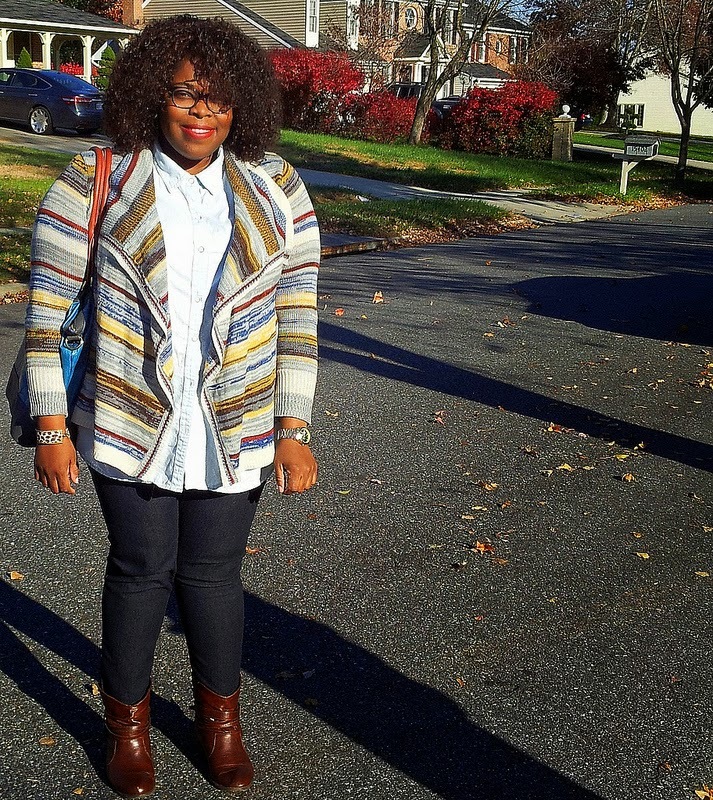 And since I'm a sucker for denim-on-denim, I wore my New Look via ASOS Curve jeans. Oh, and the shoes are from Avenue, too, but they're an old pair. 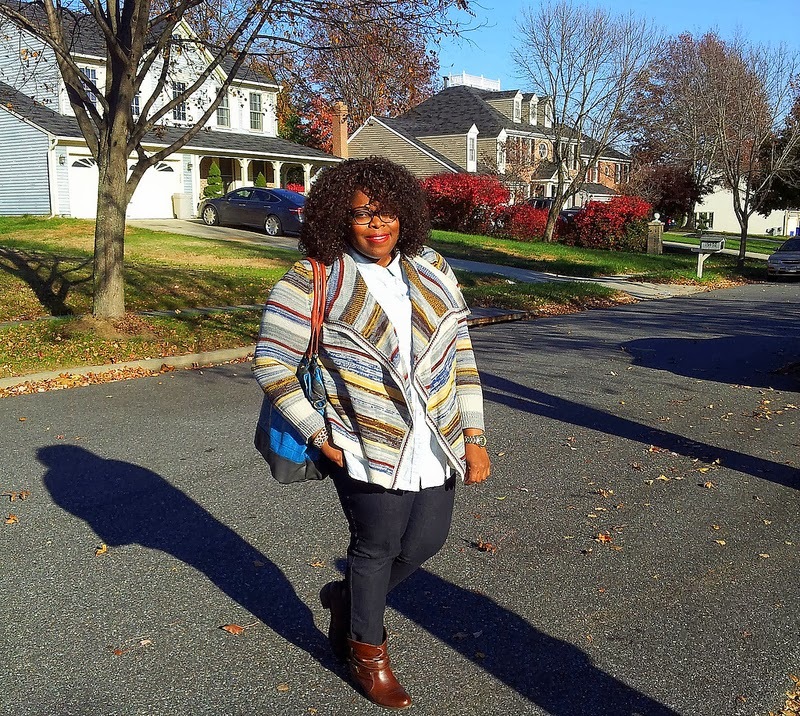 This knit drape cardigan is really comfy and what I like most about it are the fall/winter-like colors. I also wore this cardigan with a burgundy lace dress and it looked really nice, if I do say myself. I'll probably recreate the outfit and make it a post here. Probably. I believe this is a versatile cardigan that can be dressed up or down. Like I'm already envisioning a look with shorts (dark denim or maybe even a corduroy pair), black tights, knee high boots or booties, a t-shirt and the cardigan. Hmmm...I need me some shorts, first. If you're thinking of getting this cardigan - and you should since it's currently on sale - I would suggest getting it in your true size. I'm wearing a 14/16 and it fits nicely. No fear of it being too stretchy or too loose. It fits and falls over my body just right. Check back later on this week for pt. 2.